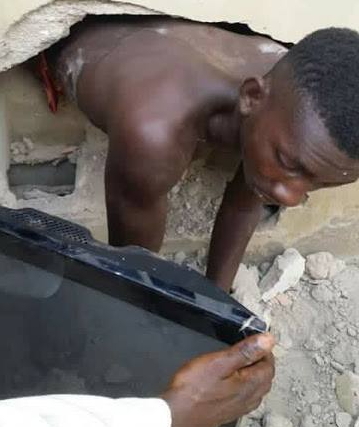 Check out a young man arrested this week after breaking through the wall of a house to steal a flat screen TV somewhere in Lagos. 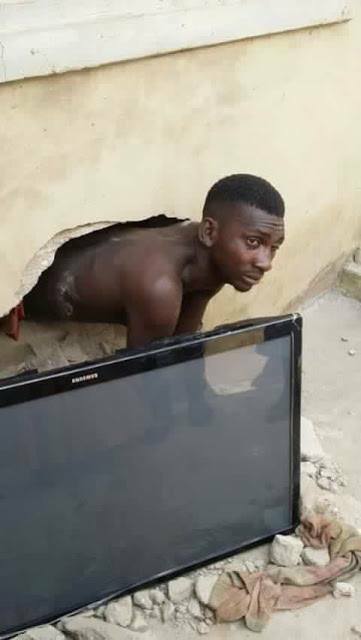 While the young thief was busy digging through the wall just to escape with the stolen LCD TV, the house owner was busy waiting for him to perform his magic and come outside while taking photos. 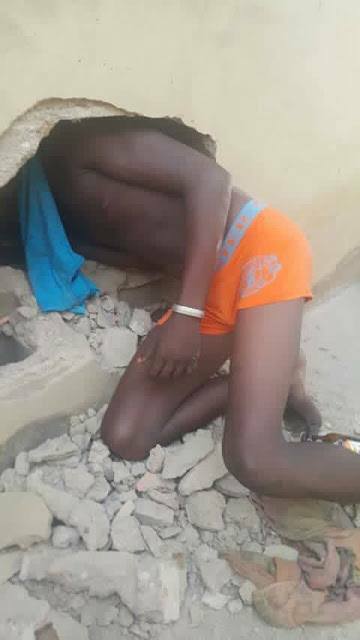 If this able-bodied young man has enough energy to break through the wall, why can’t he put the same energy to work out a legal business? This same ‘get rich quick’ mentality is what is killing youths of nowadays. 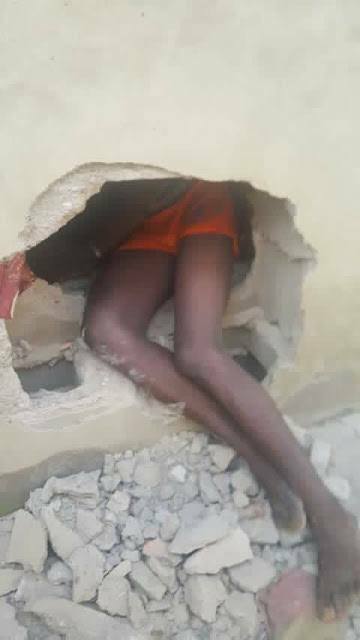 Here are more photos the house owner took while the thief was busy breaking the wall. Hungry thief! With potential armed robbery, if not delivered from the spirit of stealing through prayers or some jail time. you go to this length because of Plasma TV, rot in jail. As punishment he should be taken to Quarry were they break blocks he must be very good at it. Lazy boy. Very funny. I laugh as I look at these photos. This TV is not normal. 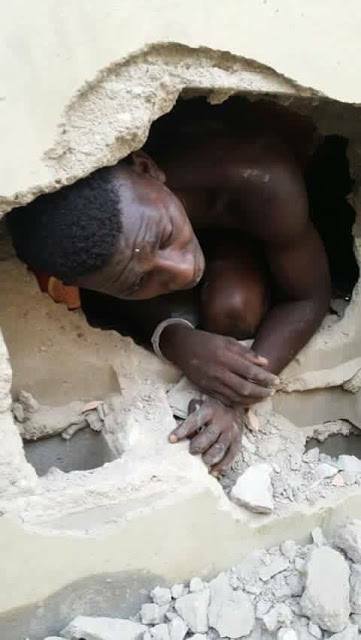 Our people will go to any length to steal commit crime. 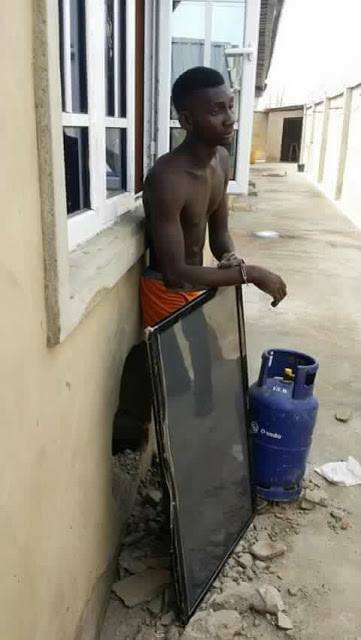 How can he break a house just to steal this. My God. He needs serious deliverance from that weed he took before embarking on this mission to clear his brain and eyes.